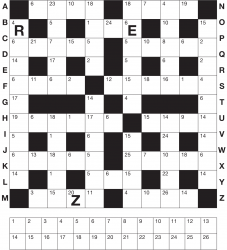 The aim of a Codeword puzzles is to crack the code and reveal a standard completed crossword grid, where every word reading either across or down is a standard English word. Proper nouns, multiple word entries and acronyms are not allowed, unlike in standard crosswords. 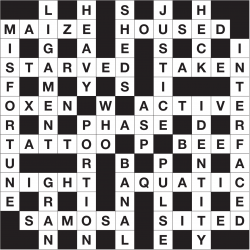 Each letter in the crossword has been replaced by a number, and your aim as the solver is to work out which number corresponds to which original letter. All 26 letters are found in at least one place in the grid, and so the code will have a unique solution. You can keep track of your solution using the number to letter boxes beneath the grid, and keep track of the letters you've already solved using the cross-off letters outside the grid. 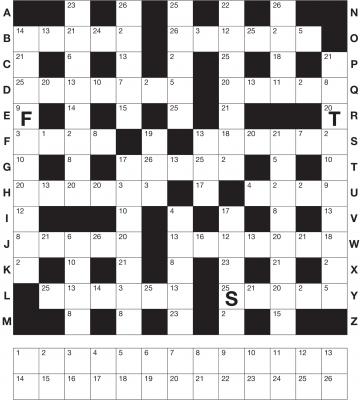 Codeword puzzles are usually solved via a combination of skill and intuition. It's particularly helpful to look for double letter sequences, as well as letters that appear frequently throughout the grid. Some initial solved grid squares are also given to help you start off.